This Bundesliga fan is the hero we all need right now. 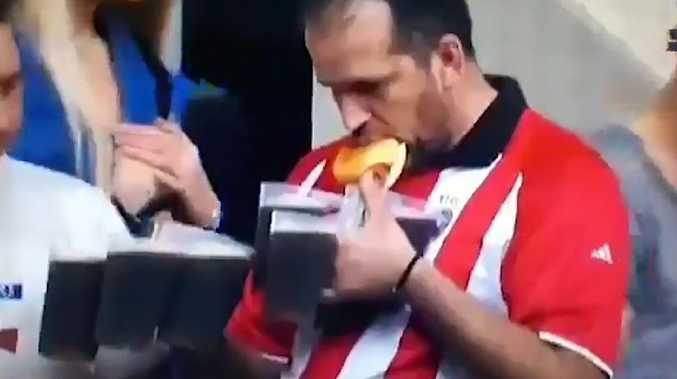 A GERMAN football fan sent social media into meltdown during Fortuna Dusseldorf's clash against Schalke after he was spotted carrying up to eight pints while simultaneously eating a bratwurst. But despite having no hands spare, the individual managed to chomp down on his sausage at the same time â€" much to the delight of social media. Wearing what looks to be a retro Red Star Belgrade jersey, the supporter showed that not all heroes wear capes. A freelance reporter named Archie Rhind-Tutt pointed out the man with over 4000 Twitter followers retweeting and over 17000 likes. Best Assist of the year! If ever there was an argument against Brexit. These are skilled people we’re abandoning!! My disappointment of the Bundesliga weekend - his friends... someone help the dude.. someone please.. Even with handles, good show. As a bartender I'm accustomed to carrying, like, four to five pints of beer around. And am sometimes surprised some people get confused at three. Seven? Good on ya, good show. Unfortunately for Fortuna, their disastrous start to the Bundesliga season shows no signs of improvement after they lost 2-0 against the Royal Blues. Second half strikes from Weston McKennie and Guido Burgstaller condemned Friedhelm Funkel's side to a third consecutive league defeat. They sit second bottom in the table, while Schalke climbed out of the relegation zone into 15th spot.